It's easy to find information about Halong bay budget travel around the net, however there is little information about Halong's next door neighbor Lan Ha bay. In this article I would like to share some experience about how to rent a boat to Lan Ha bay when you have a chance to visit Cat Ba island. 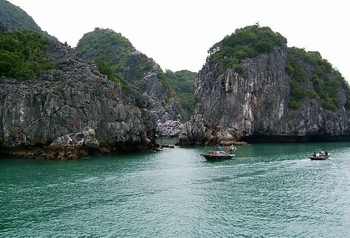 Lan Ha bay is seen as a princess located in the south of Halong Bay with thousands of scattered islands. The special thing of Lan Ha Bay, you can take a boat to visit the mountains on the islands that have extremely beautiful sandy beaches at the foot. Lan Ha bay is also famous for Van Gia fishing village about 15 minutes by boat from Cat Ba town, this is an old floating village over one hundred years with thousands of households living mainly by fishing. Also, when cruising on Lan Ha Bay, visitors can swim at beaches of Monkey Island or if you like walking in the forest you can take the boat to visit Viet Hai village, located deep in Cat Ba national park, separated from the outside world. - From Cat Ba to Lan Ha bay, fishing in 3 hours: 90 usd. You can rent a boat from Cat Ba to Halong bay, 120 usd - 150 usd depending on number of visitors.